Presenting in near new condition throughout, this compact catamaran comes with everything you need for coastal cruising. She's been exceptionally well built and fitted out with a spacious galley, 2 large double berths, the heads and single berth forward in both hulls offer loads of space. She comes with a decent array of electronics and electrical gear, solar panels and a quality chart plotter. Her good sail wardrobe is in excellent condition as are her two 9.9hp high thrust outboards with have very low hours. 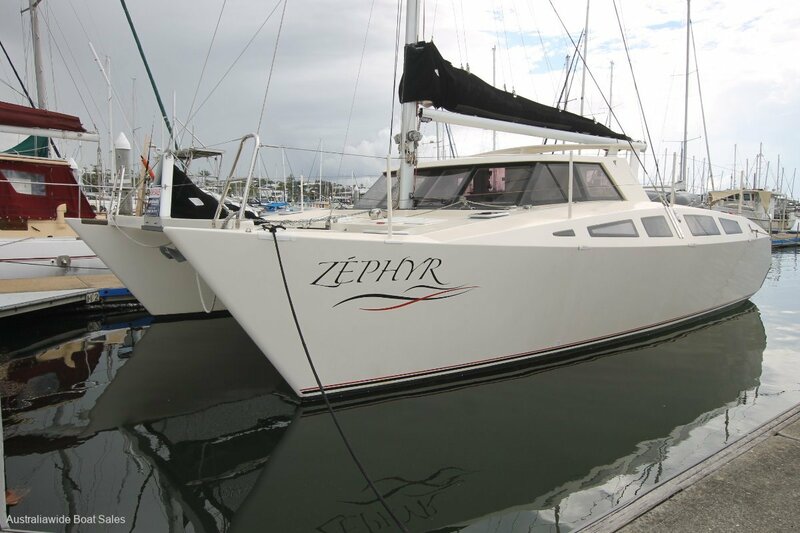 Located on a marina berth at our Manly Qld office, this very tidy catamaran is ready to go. 2 x 9.9 four stroke, high thrust outboards. 210 litres via two aluminium tanks. 300 litres via 2 bladders. Smev 3 burner gas stove top, Smev stand alone oven with grill, stainless steel sink, large blackwood benchtop and an abundance of dry storage space. Waeco 85 litre refrigerator / freezer. 6 seater dining table in main saloon, port hull: with double berth aft, navigation station and heads forward, starboard hull: double berth aft, galley and single berth forward. Hot and cold pressure shower. TMC electric toilet with holding tank. Flat screen LED TV with built in DVD player. Sony sound system. 35lb Delta anchor on 50m of chain to a Lewmar electric 2 way capstan. EPIRB plus all required inshore safety gear, including 6 life jackets, fire extinguishers and 2 electric bilge pumps, first aid kit. 2 x 120Ah house batteries, 2 x starter batteries, isolation switches, all LED lighting and nav lights, 2 x 85watt solar panels on stern mounted davit, charge controller, circuit breaker switchboard. Raymarine C90W GPS/plotter mounted on a 'Navpod' with Navionics Platinum charts, Raymarine: ST6002 autopliot, ST60 speed, ST60 wind, ST60 depth instrument. Navman VHF transceiver. Fully battened fat head mainsail, headsail, stormsail, MPS with sock - all in excellent condition. Alloy mast and boom, stainless steel standing rigging. Tender davits, lewmar 2 speed ST winches, cockpit cushions, transom steps on both hulls, swim ladder, deck wash, twin webbed trampolines, fenders and mooring lines. Survey report conducted 2018 available to veiw during inspection. Last antifoul - mid 2018.